Well, a big development happened this last weekend. It was totally unexpected and turned our lives upside down. All our plans for the summer are are scrapped. Everything has changed. And it’s the best news I’ve had in 19 months! Yep, you read that right. We’re moving back to Nevada. Hopefully in just a couple months! Now, it’s still not set in stone and we haven’t actually done anything besides start clearing out cabinets and begin a garage sale pile. But that in and of itself is a huge step. 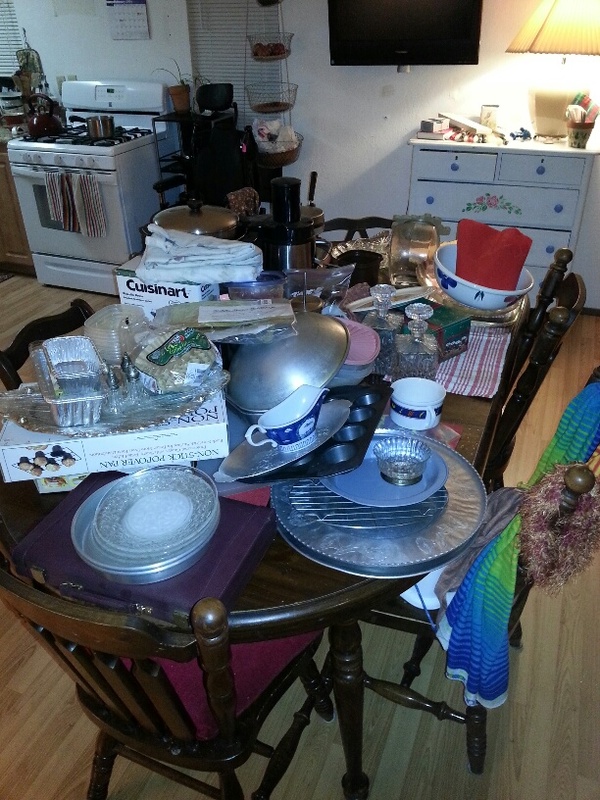 The dining table is full of stuff to sell. And Mom and Dad are both on board. We’re moving as soon as we can get the house ready and on the market and sold! But how are we going to do that? We don’t even have a building permit yet, let alone a finished house to move into. And won’t for a while. Well, Mom and Dad have decided that they would be quite comfortable living in a travel trailer on the property while we build. They even have a brand new one all picked out and will be purchasing it soon! So they’ll have their trailer and we’ll have ours, and we’ll all be living on the homestead soon! This of course means no gardens this year. But I’m ok with that. It means getting all those little projects around the house done (or deciding to just leave them), and I’m totally on board with that. It means lots and lots of work and very little down time, and in a way I’m looking forward to that. It means that our prayers (and those of a bunch of other people) have been answered. And that is a wonderful thing! This entry was posted in Building a Home, Newsy Stuff, Portland Interlude 2014-2016 and tagged moving on February 24, 2016 by Maridy. Wow – this is wonderful! I know you are so happy and I am happy for you! Thanks Vickie. We are so excited!